WORKS WITH: Oil paint, the "Divine Order", mixed media, and students. "I paint flowers because they are good models. As I paint from life, orchids hold their pose and last for weeks. I do paint other subjects using the same drawing pattern, such as landscapes, but it is more of a challenge to find these relationships as the elements (water) move and change so rapidly. Nature has these divine properties in it. Like Cezanne and Van Gogh, I look for this order in flowers in relationship to their environment because they have a dynamic design. My work has been described as conceptionally simple; my hope is that the work is perceived as strong on craft, color and composition utilzing the pattern with its inherent relationships that point to an Intelligent Designer. I think of this drafting like a pianist playing scales before performing or like an athlete doing movement/warm-ups before a competition. This foundation gives me a girding to which I can "let go" as I look; a formula for freedom. From this, I can get into that "zone" in which a piece of art blossoms." 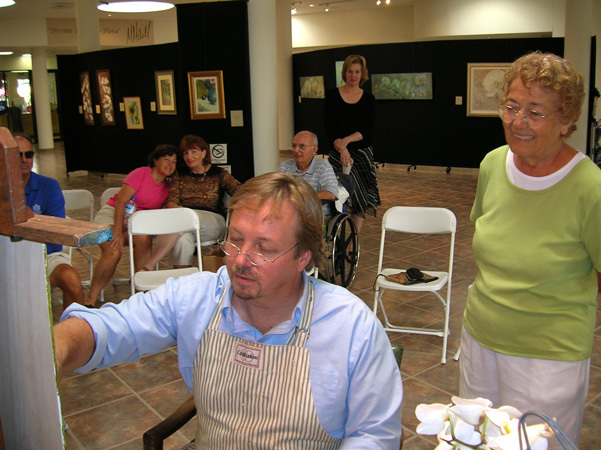 Mark Merrill is currently an Artist in Residence at Calvary Christian Academy in Fort Lauderdale, Florida, and is teaching Art to high school students. Mark worked as an Artist-Missionary with his wife, Robin, in the Philippines from 1991-2001. 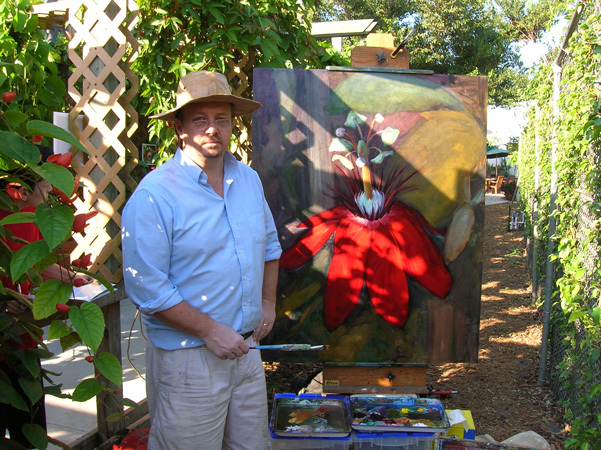 He has been a professional artist since 1976 when he started apprenticing under John Q. Archer, designing and fabricating large paintings and specialty projects for clients such as United Airlines, the American Medical Association, and Leo Burnett Advertising. Mark's formal education started with Marketing and Advertising at Miami University of Ohio and ended with honors in painting and holography (Bachelor of Fine Arts) at Art Center College of Design, Pasadena, California-one of the top art schools in the world. Mark has been the Director and Curator for the International Fine Art Holographic Museum and Gallery in the business district of Los Angeles, California. As a holographic specialist for Applied Holographics, LTD., London, England, he worked on images of singer Michael Jackson, the NFL's Super Bowl Silver Anniversary Trophy, and portraits of Jacques Cousteau and the late Pope John Paul. His work appreciates in value steadily, and over the past 15 years has averaged an increase in approximately 1-2% annually. Mark utilizes a pattern he calls the "Divine Design", which is drawn out onto every surface before he lays in the composition. This painstaking method is original to this artist, and he has extrapolated his grid from the Golden Mean, also known as the Fibonacci Theory. This pattern of the Universe can be seen thoroughout nature, in architecture, in the human body and all created order. It is the standard on how your eye perceives Beauty. Mark donates a large portion of his proceeds to fund the economic development projects of his non-profit organization, the Christian Cultural Development Foundation. CCDF is the umbrella organization for the Upper Room Art Gallery, as well as the Mission Gifts Fair Trade Store, which provides jobs to people leaving prostitution, human trafficking victims, HIV-AIDS patients, street children, and garbage dump dwellers, around the world.